LOL This is just a silly post, but it always bugs me to see people who own the breed spelling its name wrong. Pit when referring to the APBT is written with one "T"
Pit Bull is the slang for our breed but sadly is also used to encompass many other breeds which look like the APBT by those who write BSL and often many in the general public. nor are blue nose, red nose, purple nose etc. Those are just colors. The same thing as pibbles, duh!! Funny you say this. At my work everyone wrote it different on the files: Pitt, Pitt Bull, Pitty, Pit Bull Terrier, Staffy, it goes on and on and on. Then we had my Shelter Guide to the APBT class and now everyone writes it APBT. Im SO proud of them! Wow are you kidding me. We do not kidd with educating people. Sometimes it's better to go a laid-back approach though. I don't know that seems kind of nit-picky, some people just aren't great spellers. When our veterinary software for the hospital was " updated " , the breed selection list couldn't (actually, still can't) be changed. 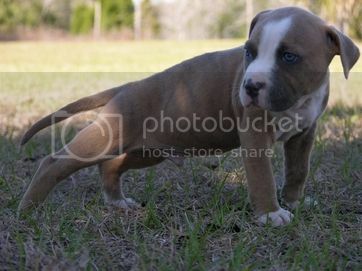 Their first version was apparently off of the AKC breed lists, so all they had was American Staffordshire Terrier. I know that I am a dufus about it, but it drove me NUTS to call each and every APBT an AmStaff in the computer. Apparently, I wasn't the only one who complained, so they improved upon the list and added... Pitbull.. aaargh! Next they improved it to Pit Bull Terrier. It's finally corrected to American Pit Bull Terrier, however it took yet another millenium for everybody to understand that you look under the "A" - s when you are entering APBT's. Is that really a legit excuse in this day and age - especially since spell check is so handy on a computer? Face it, people are judged based on their education, or apparent lack thereof. I find it hard to take people seriously who can't even take the time to spell their dog's breed correctly. YAY! Other people who feel as strongly about using the correct terms as I do! From my experience, you can tell a lot about a person's involvement with dogs by how they refer to APBTs!